Born 8 September 1918, Gravesend, England. 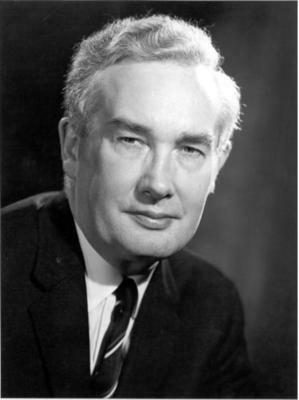 Sir Derek Harold Richard Barton (1918-1998) was Regius Professor of Chemistry at the University, 1955 to 1957. He won the Nobel Prize for Chemistry in 1969. Born in Gravesend, Barton studied at Imperial College, London and graduated BSc with honours (1940). During the Second World War he worked on a research fellowship from the Distillers Co Ltd studying the synthesis of vinyl chloride (he was awarded a PhD in 1942) and then in military intelligence. 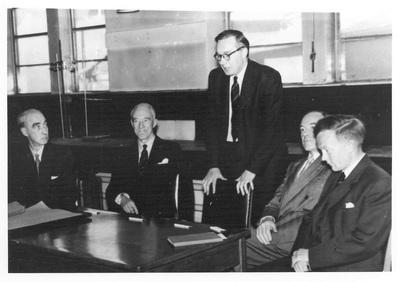 In 1945 he returned to Imperial College as a lecturer; he worked with ICI from 1946 until 1949 (the year he was awarded a DSc), and he was a Reader and then Professor of Organic Chemistry at Birbeck College, from 1950 until his appointment to the Chair at Glasgow. During 1949 he was a visiting professor at Harvard University, where he began his ground-breaking work on conformational analysis. Barton spent only two years at the University before returning south to become Professor of Organic Chemistry at Imperial College. However, he collaborated at Glasgow with Monteath Robertson, the Gardiner Professor of Chemistry, on important research into structural problems involving clerodin, limonin, and the sesquiterpene carophyllene, and he also began the research into organic photochemistry which resulted in the development of a photochemical procedure which became known as Barton's Reaction. In 1969 Barton and the Norwegian chemist Odd Hassel were awarded the Nobel Prize for their contributions to the development of the concept of conformation and its application in Chemistry. Barton was knighted three years later and received the Légion d'Honneur. After working for many years in France he moved to the Texas A and M University in 1985, where he died in 1998.